Ford has announced four newly established, integrated teams for its mobility division. The mobility unit’s Ford Smart Mobility LLC subsidiary is acquiring transportation architecture and technology provider Autonomic while Ford is also acquiring TransLoc, which provides technology for cities running transit solutions. Terms of the acquisitions were not disclosed. 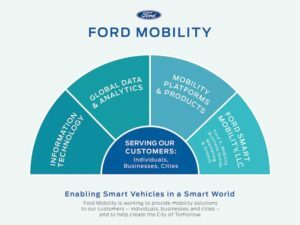 Ford said the acquisition of Autonomic would accelerate its plans to establish the Transportation Mobility Cloud – which will be expanded beyond Ford to include other automakers, suppliers, partners and cities from 2018 – and support its plans to scale up other key mobility initiatives, including the drive toward full connectivity. Ford’s mobility team is currently looking to drive the company’s commitment of 100% connectivity of new vehicles in the United States by 2019 and push toward its goal of 90% connectivity globally by 2020. Autonomic will also aid Ford’s plans for a raft of ride-sharing launches in cities globally this year under its Chariot brand, and its plans for non-emergency medical transportation.